Welcome to what is almost certainly the best Word Search puzzle site on the web! Our site makes it ridiculously easy to generate your own printable Word Search puzzles! Or, select an existing themed puzzle from our ever-growing library. Quickly and easily create your own custom Word Search puzzle using your words! Simply enter a list of words, set your puzzle options, and click a button! Then, print with your browser. 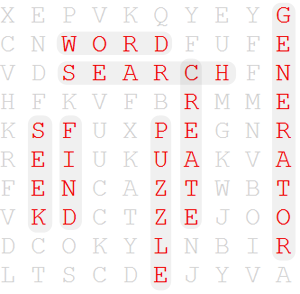 Generate a Word Search puzzle from our library of themed word lists! We have puzzles for holidays, events, sports, and more, for all age levels! And be sure to check out our Featured Puzzle! We're currently working on mobile versions of an interactive Word Search game for iPhone, iPad, and Android devices. Stay Tuned! Until then, check out our other mobile apps!